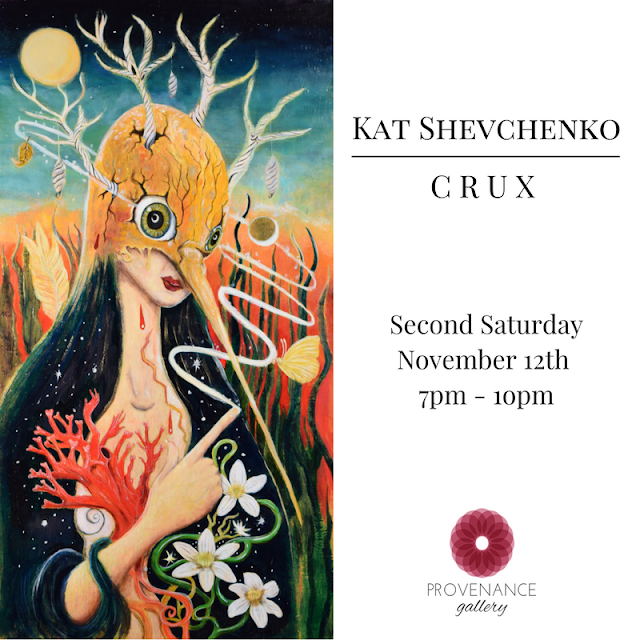 Provenance Gallery is pleased to present, Crux, an exhibition featuring recent paintings by Kat Shevchenko. "Crux is a documentation of the the internal world of the psyche in the moments of upheaval. When I came across the the word crux, meaning, the core, or essence of something resonated with me. I knew that was the impetus of what my current paintings' theme had been revealing. While I created them I was battling my internal morass with the need to reconcile changes that had transpired within and without. Life’s trials and struggles produce alchemical reactions that forever transmute the self. In Crux, I longed to capture the beautifully chaotic process of transformation at the pivotal moment as it transpires, or in the wake of its aftermath. This mysterious process is depicted in the feminine embodiment with symbols from the natural world to reveal what is simmering beneath the surface of consciousness. At times devastatingly emotional, at other times existentially retrospective, these are the introspective journeys within that are seldom seen." Kat Shevchenko was born in San Antonio, Texas. She studied illustration at the Academy of Art University in San Francisco, CA and painting at the University of Texas at San Antonio. In 2006 she ventured to Austria to study the Old Master’s/mixed technique of painting with oils over egg tempera under paintings. Guided by surrealistic automatism she continues to explore experimental approaches utilizing traditional oil painting techniques driven by inspiration from the natural world, dreams and life experiences which are interwoven into a personal mythology that has influences ranging across the spectrum from the Renaissance, surrealism, and symbolism and at times infuses a delicate touch of dark humor. Exhibition will be on view until November 27th, by appointment.